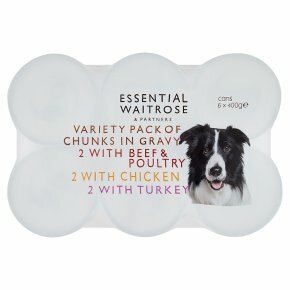 Offering superb value and excellent quality, this essential Waitrose dog food selection is ideal for stocking up. The pack contains six 400g tins of meaty chunks in gravy in three different flavours. The selection includes; beef and poultry, rabbit and turkey and chicken and liver. INGREDIENTS: wheat flour, water, mixed seeds (9%) (sunflower seeds, sesame seeds, golden linseed), rye flour, oat flakes, salt, yeast, wheat gluten, malted wheat flour, flour agent treatment ascorbic acid.